Early on the first Saturday of the Easter holidays we drove two miles to the railway station, left the car and stepped on to the 7.24am train to Inverness on the first leg of our train adventure. The five of us, two adults and children of 14,13 and 11, each with rucksack, made our way first to London to overnight with family, then the next day to Munich: a long-ish day with three changes but we were prepared for it and passed a very relaxing day looking out at the changing landscape, reading, playing cards and listening to music. A couple of nights in a hostel in Munich gave us the chance to explore the city; the next leg was to cross the Alps through the beautiful Brenner Pass to Venice. 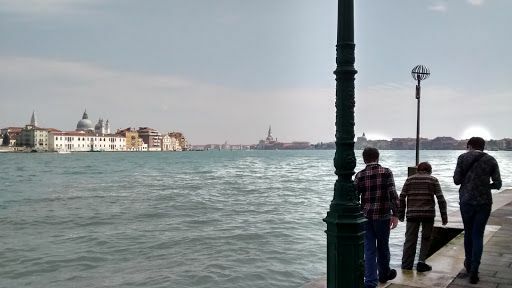 Stepping out of the railway station to the bank of the Grand Canal was magical. 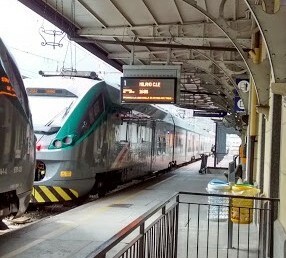 A few days in Venice then south to Naples on the 200kph Italian intercity. With Naples as our base we caught the local train to Vesuvius and climbed to the lip of the crater (warning: if you could see boiling lava then they don't let you up there ... but warmish grey gravel isn't very exciting...). The following day another local train took us to the ruins of Pompeii and Herculaneum. We left Naples early the next morning for the Italian / Swiss border and re-crossed the Alps on the narrow gauge Glacier Express: panorama coach highly recommended. A couple of days with family near Offenburg and in Amsterdam, then home on the overnight Newcastle ferry, and the train back to Muir of Ord in time for school and work on Monday morning. We all felt that we'd had the perfect low-stress adventure. Instead of flying in and out of one place, we meandered around and fitted a lot in, but the train made it so civilised and relaxed. What made it work? The fantastic train travel website www.seat61.com which makes all the planning entirely straightforward. It took time, certainly, but the website pulls together information from all the international train companies so that it's easy to plan a trip across different countries. It's easy to find the fastest routes, the most scenic, sleepers, cheapest tickets, special offers etc etc. Limiting the one-night stopovers, choosing accommodation very close to the stations, planning route and stops all in advance all helped: we didn't need InterRail-type tickets as we didn't need flexibility. All in all it was a fantastic trip and we'll definitely use Seat61 again. Events to add to calendar? Contact Us. We are part of the rapidly expanding worldwide Transition Towns movement. The Black Isle is a peninsula of about 100 sq miles ENE of Inverness in Scotland, UK.